It's almost time to open up the Playbook this season. Panini America's book-based football brand arrives once again on Wednesday and the company took the time to release a number of preview images for 2016 Panini Playbook football cards this afternoon. This entry was posted in Football and tagged NFL, Panini America, 2016 Panini Playbook, Playbook on September 30, 2016 by BlowoutBuzz. What's buzz-worthy: Opening Day returns for another season with an insert card in every pack, all the things collectors have come to expect and a few new surprises -- among them will be cards for notable bobblehead giveaways and Incredible Eats at the ballpark. This entry was posted in Baseball, First Buzz and tagged MLB, Topps, 2017 Topps Opening Day on September 30, 2016 by BlowoutBuzz. Pokemon turned 20 years old this year and the popular animated series and trading card game has had its share of fans and collectors through all those years -- collectors from around the world. And that's where Blowout reached out to land a pair of items from the Japanese market that are now available to fans here in the United States. This entry was posted in Gaming and tagged gaming, Pokemon, Pokemon XY 20th Anniversary Surfing Pikachu blister pack, Pokemon XY Break 20th Anniversary Concept booster box, TCG on September 30, 2016 by BlowoutBuzz. 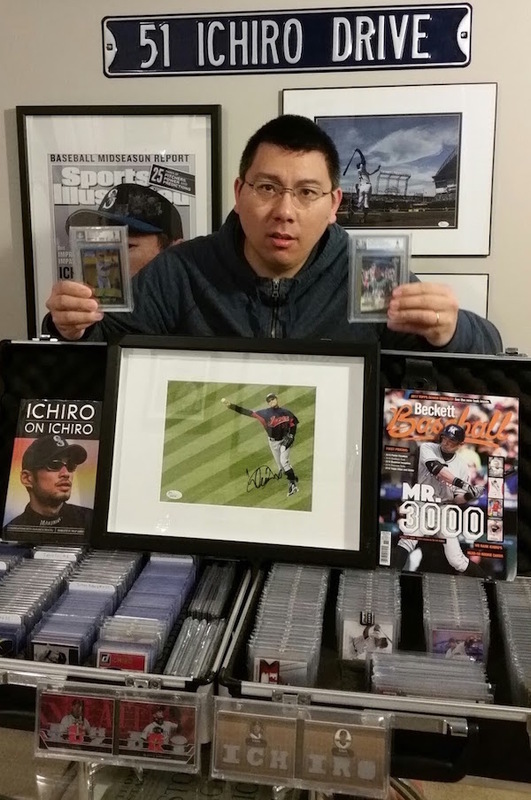 This entry was posted in Baseball, Board Buzz, Football and tagged Ichiro Suzuki, MLB, NFL, Topps, 2016 Topps Triple Threads, card backs, collation, Lady Gaga, worthless cards on September 30, 2016 by BlowoutBuzz. The first Rogue One trading cards hit the market today, adding to the Star Wars legacy of cardboard that's spanned nearly 40 years with Topps. Like the movie, which sets the table for what's to come (and already came to the big screen), 2016 Topps Star Wars Rogue One: Mission Briefing does the same by offering glimpses from the movie that arrives on Dec. 16 without any cardboard spoilers. This entry was posted in Movies, Non-sports and tagged Star Wars, 2016 Topps Star Wars Rogue One: Mission Briefing, Rogue One, Rogue One: A Star Wars Story on September 30, 2016 by BlowoutBuzz. There's still plenty of time on the clock before the Nov. 11 arrival of 2016-17 Leaf Ultimate hockey, but that's just more time to appreciate some of its inclusions. This entry was posted in Hockey and tagged game-used memorabilia, Leaf Trading Cards, NHL, 2016-17 Leaf Ultimate on September 30, 2016 by BlowoutBuzz. This entry was posted in Baseball and tagged Andrew Benintendi, Boston Red Sox, Craig Kimbrel, David Ortiz, David Price, MLB, Mookie Betts, Topps, Yoan Moncada, Dustin Pedroia, Jackie Bradley Jr., Topps Now on September 29, 2016 by BlowoutBuzz. A trio of charities will be helped by fans of three Boston guys who are pretty well-known there. A fund-raising initiative between New England Patriots quarterback Tom Brady, Ben Affleck (Batman!) and Matt Damon (Jason Bourne!) is ongoing giving the chance for someone to hang out with the three to talk some football, movies & more as part of a trip to Boston. This entry was posted in Autograph Collecting, Baseball, Football, Movies and tagged Tom Brady, Ben Affleck, charity raffle, Eastern Congo Initiative, Matt Damon, Omaze, TB12 Foundation, Water.org on September 29, 2016 by BlowoutBuzz. Former New Orleans Saints player Steve Gleason is fighting ALS, or Lou Gehrig's Disease, but that isn't stopping him from helping fight the fight by signing an autograph for charity. And he did it with his eyes. A Saints jersey he signed with the aid of a robot/autopen is among 10 items up for grabs via NFL Auctions in an auction ending soon. This entry was posted in Autograph Collecting, Football and tagged NFL, ALS, Lou Gehrig's disease, New Orleans Saints, NFL Auctions, Steve Gleason on September 29, 2016 by BlowoutBuzz. What's Buzzing Today: Big breaks, big card sales and ... new laws? This entry was posted in Baseball and tagged autographs, 2016 Topps Heritage Minor Leagues, 2016 Topps Triple Threads, consignment on September 29, 2016 by BlowoutBuzz. California has a new law requiring autograph sellers to document their pieces valued at more than $5 with an extensive letter detailing the who, what, when where of it all. It's a good thing, but it's also bound to create some challenges for smaller dealers or event organizers in the state who now have to keep track of all inked items, document them and have guarantees saved away for years. This entry was posted in Autograph Collecting and tagged autographs, California autograph law on September 29, 2016 by BlowoutBuzz. Topps Heritage arrived today for the guys down on the farm but the 2016 Topps Heritage Minor League set and its autograph checklist are loaded with some big-league talent thanks to a talented crop of newcomers. And that means there are some good variations and autographs to chase. This entry was posted in Autograph Collecting, Baseball and tagged Alex Bregman, Andrew Benintendi, Bryce Harper, Dansby Swanson, Mike Trout, MiLB, Topps, 2016 Topps Heritage Minor League on September 28, 2016 by BlowoutBuzz. What's Buzzing Today: Nothing but breaks today and a single Spectra box above leads way. This entry was posted in Baseball, Basketball, Board Buzz, Football and tagged Walmart, 2016 Panini Spectra, 2016 Topps Heritage Minor League, Prizm, Topps Finest, Totally Certified on September 28, 2016 by BlowoutBuzz. What's buzz-worthy: This MLBPA-approved product includes bats from top young names as well as established veterans -- a roster that includes Corey Seager, Mike Trout, Gary Sanchez, Miguel Cabrera and Miguel Sano to name a few. This entry was posted in Autograph Collecting, Baseball and tagged Corey Seager, Miguel Cabrera, Miguel Sano, Mike Trout, Onyx Authenticated, 2016 Onyx Baseball Clubhouse Lumber Edition, Gary Sanchez on September 28, 2016 by BlowoutBuzz. It's another Topps Now first. There's also a standard Relic of the card among the seven cards for the day. This entry was posted in Baseball and tagged Cleveland Indians, Francisco Lindor, MLB, Topps, Dee Gordon, Jose Fernandez, Topps Now on September 27, 2016 by BlowoutBuzz. There's now more political cardboard to be had. Topps has entered the election realm with a set of Topps Now cards that launched today after the first Presidential debate Monday night. This entry was posted in Non-sports and tagged Topps, Donald Trump, Hillary Clinton, Political memorabilia, presidential election, Topps Now, Trump-Clinton Debate on September 27, 2016 by BlowoutBuzz. Buffalo Sabres star Jack Eichel is a Leaf Trading Cards exclusive when it comes to autographs, but the company is giving collectors a chance to get his ink on other company's hockey cards via an upcoming private signing. According to the company, it's the only way to get non-Leaf cards signed as the former No. 2 pick will not sign them if asked to in-person. This entry was posted in Autograph Collecting, Hockey and tagged Jack Eichel, Leaf Trading Cards, NHL, Upper Deck, Buffalo Sabres, Jack Eichel autographs on September 27, 2016 by BlowoutBuzz. More than 300 items from the collection of New York Yankees great Don Larsen are on the auction block via Steiner Sports but they're not all glorious tributes to the man who pitched a perfect game in the World Series. Some include some real talk -- like this letter to Larsen from former Kansas City Athletics General Manager Frank Lane. Larsen, of course, went on to pitch into the 1967 season before retiring at age 37. This entry was posted in Auction Buzz, Baseball and tagged New York Yankees, Steiner Sports, Don Larsen, Kansas City A's, player contracts, Steiner Auctions on September 27, 2016 by BlowoutBuzz. The newest Topps Now team set is all about The Tribe. With the Cleveland Indians clinching the American League Central title last night, Topps has unveiled a new take on its real-time baseball card program with another team set. The Indians are the fifth postseason-bound team to get a set released as an extended part of the program with the sets costing $49.99. This entry was posted in Baseball and tagged Cleveland Indians, MLB, Topps, Topps Now on September 27, 2016 by BlowoutBuzz. After a delayed arrival due to a packaging issue, this year's edition of Triple Threads is here on Wednesday and 2016 Topps Triple Threads will include plenty of the high-end creations that we've come to expect in the line. It will be a show to see what starts popping out of packs tomorrow, but Topps (and a few early breakers) have given us a glimpse at what's to come. This entry was posted in Baseball and tagged MLB, Topps, Triple Threads, 2016 Topps Triple Threads on September 27, 2016 by BlowoutBuzz. The clock is ticking down to the arrival of from 2015-16 Panini Flawless, which will pack plenty of high-end material into its pricey briefcases. Just how much? Well, Panini America offered us a glimpse at what's possible today. 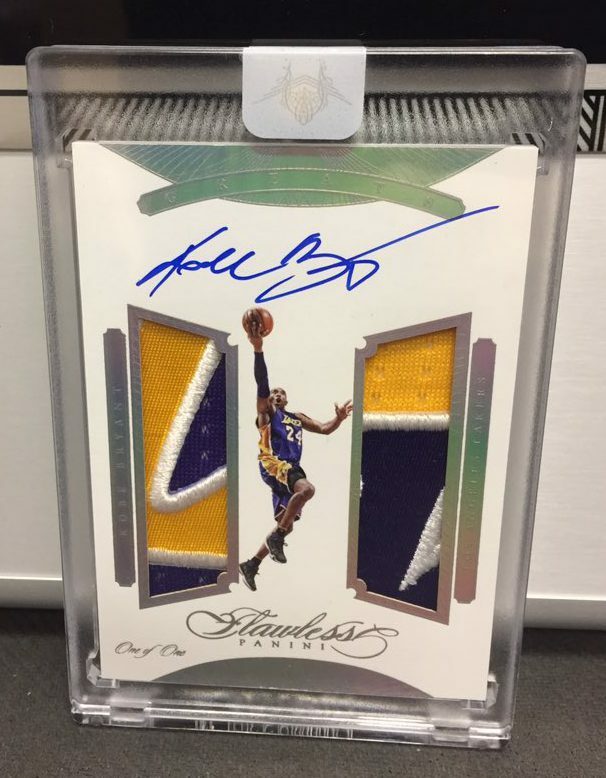 This entry was posted in Basketball and tagged 2015-16 Panini Flawless, NBA, Panini America, 2015-16 Panini Flawless basketball on September 27, 2016 by BlowoutBuzz. What's Buzzing Today: Jose Fernandez, Arnold Palmer, Heritage High Number and "sensitive" baseball players. This entry was posted in Baseball, Board Buzz, Golf and tagged Miami Marlins, MLB, 2016 Topps Heritage High Number, Arnold Palmer, Jose Fernandez on September 27, 2016 by BlowoutBuzz. Topps has the Garbage Pail Kids on the Presidential debates and their verdict is in. It's a "Disgrace to the White House." This entry was posted in Non-sports and tagged Topps, Donald Trump, Garbage Pail Kids, GPK Disgrace to the White House, Hillary Clinton on September 27, 2016 by BlowoutBuzz. It's a simple piece of memorabilia, but it's one that's part of a collection lasting more than 60 years. It's the cover of Sports Illustrated and Arnold Palmer graces the cover of the latest issue. This entry was posted in Golf and tagged PGA, Arnold Palmer, SI, Sports Illustrated on September 26, 2016 by BlowoutBuzz. The newest Topps Now team set is now here. With the Los Angeles Dodgers clinching the National League West title last night, Topps has unveiled a new take on its real-time baseball card program with another team set. The Dodgers are the fourth postseason-bound squad to get a team set released as an extended part of the program with the sets costing $49.99. This entry was posted in Baseball and tagged Los Angeles Dodgers, MLB, Topps, Topps Now on September 26, 2016 by BlowoutBuzz.